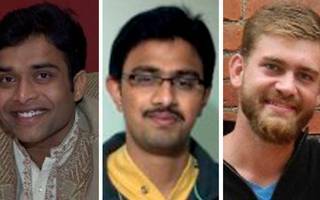 Washington– The Indian American community in Houston has presented $100,000 to Ian Grillot, a 24-year-old American who was shot while trying to save Indian techies Srinivas Kuchibotla and Alok Madasani during a shooting in Kansas. The Indian Ambassador to the US, Navtej Sarna, presented the cheque to Grillot at the annual India House gala in Houston on Saturday evening, The American Bazaar news portal reported. Kuchibhotla, 32, was killed when Adam W. Purinton, a white man, shot the Indians at the Austins Bar and Grill in Olathe on February 22. Madasani and Grillot, who tried to stop the killer, survived with injuries. Speaking at the event, Grillot said: “I don’t know if I could’ve lived with myself if I wouldn’t t have stopped or attempted to stop the shooter because that would’ve been completely devastating. “I do now have a very powerful message and if I can help empower people and spread hope and love, then why not? “I am honoured to be at India House that serves so many families from so many communities in the Houston area,” The American Bazaar quoted Grillot as saying. Jiten Agarwal, a prominent Indian American in Houston and chair of the annual gala, said: “It is not every day that one meets a genuine hero, a person who risks his life for another, and takes a bullet for a complete stranger. Agarwal, with the help of its trustees, mobilized the community to come together to honour Grillot and raise funds.